1. Up / down clamping allows easy insertion and enhances safety. Also the tooling would not be damaged easily. 2. 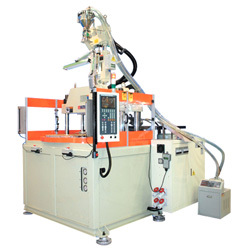 Multi-mold option can be selected to improve productivity, quality control and efficiency. 3. The vertical structure of the machine and its flexible arrangement of wires and pipes allow easy assembly, disassembly and maintenance. 4. Up / down clamping allows wider operation area on four sides of the machine. Lead frame device can be equipped to make insert molding process automatic. 5. Less floor space required, more mobility, and on line or off line process easily. 6. 2/3-color process saves time and improves efficiency. Clamping force: 10-500 ton. Injection capacity: 0.5 -50 oz. Main features: 1. Vertical clamping, vertical injection. 2. Compact design requires less floor space. Makes the take-out process more easlier. 3. Suitable for multi-purpose injection molding. Excellent for insert molding.